Completion of the year-one drilling program at Bolcana, Romania: results of over 23,000 metres at the new porphyry project confirm the size and potential of the system, as highlighted by drill hole TRSD013 which featured an intercept of 1,246.0 metres from surface grading 0.94 g/t Au and 0.27% Cu. Exploration development and underground resource expansion drilling at the Stratoni Mine: development of the hanging wall exploration drift continues, and completion of over 4,500 metres of underground drilling confirms the continuation of the Mavres Petres orebody into previously untested areas. Eldorado is a leading intermediate gold producer with mining, development and exploration operations in Turkey, Greece, Canada, Romania, Serbia and Brazil. The company’s success to date is based on a highly skilled and dedicated workforce, safe and responsible operations, a portfolio of high-quality assets, and long-term partnerships with the communities where it operates. Eldorado’s common shares trade on the Toronto Stock Exchange (TSX: ELD) and the New York Stock Exchange (NYSE: EGO). According to Peter Lewis, Eldorado’s Vice President, Exploration, the results to date from the 2017 exploration programs reflect the quality of both their brownfields programs and new projects, and bode well for extending the life of the current operations while strengthening the internal growth pipeline. “We are particularly pleased by the strong results from the Lamaque project, where we have identified high-grade vein intercepts outside of the previously defined resources, and we look forward to expanding our exploration programs to new targets on the property,” Lewis stated. Below are presented the project updates for several of the principal 2017 exploration programs. The Company’s new Bolcana project is a large copper gold porphyry system located approximately six kilometres west of its Certej epithermal deposit development project in Romania. The 2017 exploration program at Bolcana totalled over 23,000 metres of drilling in 25 holes, and tested an area measuring 1,200 metres by 900 metres, locally to a depth of more than 1,200 metres (Figure 3 and 4). 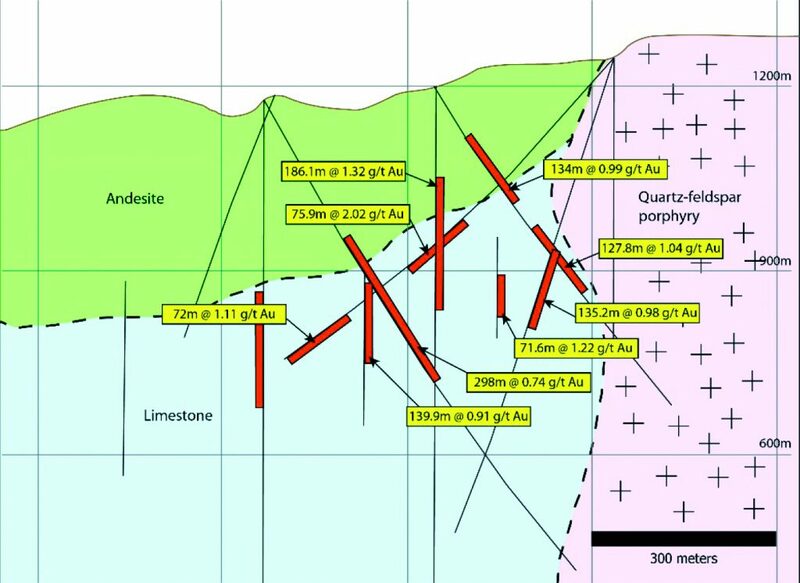 Results from the 2017 drilling outline a large gold-rich porphyry system centred on a calc-alkaline intrusive complex. Elevated gold and copper values are associated with chalcopyrite and bornite within diorite porphyry intrusions and associated magmatic-hydrothermal breccias. Mineralization is continuous to the depth extent of drilling, with highest grades found in shallow residual potassic zones and in a deeper high-grade potassic core (Figure 4). Drill hole TRSD013, which tested the central core of the system, intersected 1,246 metres from near surface with an average grade of 0.94 g/t Au and 0.27% Cu. This includes a shallow high-grade zone of 200.0 metres grading 1.43 g/t Au and 0.3% Cu and a deeper zone of 206.0 metres grading 1.55 g/t Au and 0.35% Cu. 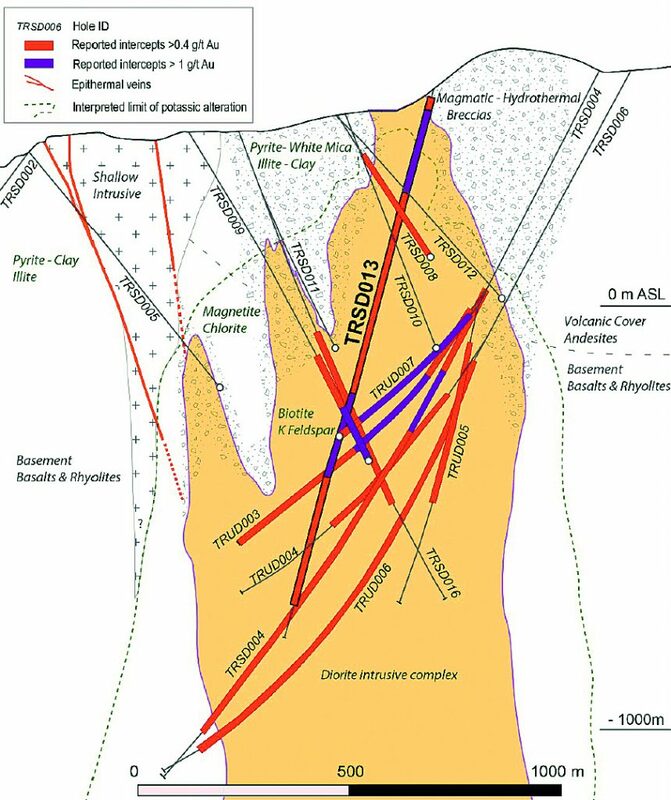 In addition, high grades have been intersected in a second shallow zone referred to as the south zone located approximately 200 metres south of the central zone (Figure 3) where drill hole TRSD017 intersected 132.0 metres grading 1.88 g/t Au and 0.34% Cu. The 2017 program was recently concluded and results are being evaluated to define future exploration plans for the project. Figure 1: Map of the Bolcana gold-copper porphyry project area showing reduced-to-pole magnetic signature overlain by projected traces of 2017 drill holes and mineralized intervals. 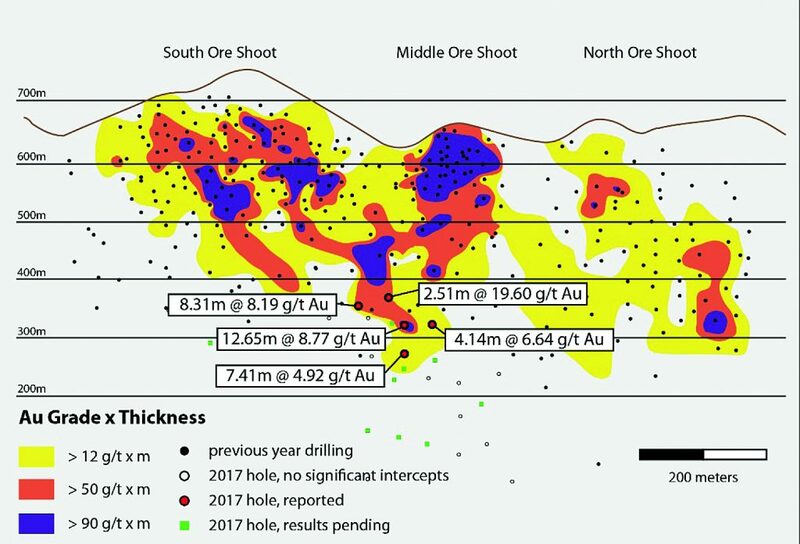 Figure 2: Representative cross section through the central zone of the Bolcana gold porphyry project showing 2017 drill holes and mineralized intervals. Section location is indicated on Figure 3; section thickness is 200 metres. CERTEJ is an intermediate sulphidation epithermal gold deposit associated with a Miocene magmatic complex in the South Apuseni Mountains, Romania. Gold mineralization is hosted within Cretaceous sedimentary rocks (black shales and intercalated siltstones to sandstones) and Neogene conglomerates, grits and volcanic and intrusive units. Three main andesitic intrusive phases are recognised in the deposit; Dealu Grozii, Baiaga and Hondol, with the Baiaga Andesite located in the center of the system and mineralization developed along the intrusive contacts, within the Cretaceous and Neogene sedimentary rocks and in the Hondol and Dealu Grozii Andesites. Mineralization has a broad E-W orientation with higher grade breccia zones oriented along NW-SE and NE-SW structures. Ore styles include disseminated mineralization in sedimentary units and at the contacts of intrusive rocks, hydrothermal breccias, stockworks and distal veins. The gold occurs with pyrite in arsenic-rich rims together with variable amounts of sphalerite and galena. Native gold is present but restricted to the distal veins. Zonation is observed both in the style of mineralization and alteration patterns with widespread clay-sericite-pyrite-calcite surrounding a core of silica-adularia. 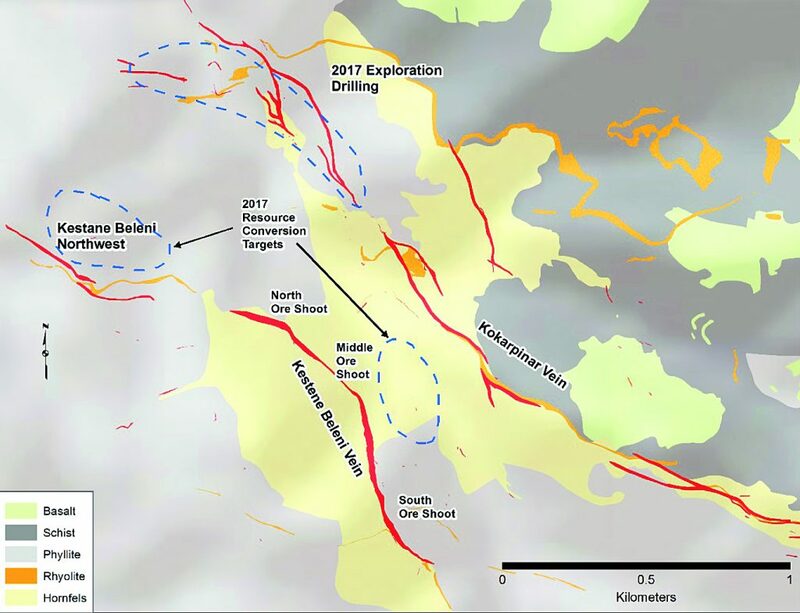 At the Efemcukuru epithermal vein deposit, drilling in 2017 included 15,700 metres of resource conversion drilling on the Kestane Beleni vein and an additional 4,000 metres testing exploration targets in the nearby Kokarpinar vein system (Figure 3). Most of the resource conversion drilling at Kestane Beleni has utilized drill stations in the new Kestane Beleni hanging wall exploration drift and has targeted inferred resources downdip from the current production levels in the South Ore Shoot and in the transition zone between South and Middle Ore Shoots. Notable results from this program include high-grade intercepts in the South to Middle Ore Shoots transition zone, with 8.77 g/t Au over 12.65 metres (EF-2703) and 8.19 g/t Au over 8.31 metres true thickness (EF-2614) (Figure 4). Surface drilling at the Kestane Beleni northwest zone has infilled areas previously drilled at a wide spacing, reducing drill hole spacing to approximately 50 metres over most of the mineralized zone. Although the vein is narrower here than in the South and Middle Ore Shoots, intercept grades commonly equal or exceed those in the current resource model (Figure 5). New drilling has defined two distinct trends of high grade ore shoots, with significant intercepts of 19.48 g/t Au over 4.32 metres (EF-024) and 173.5 g/t Au over 1.4 metres true thickness (EF-033). At Kokarpinar, exploration drilling in previous year’s program was testing the northern part of the vein system where complex splays and limited drill site availability had hampered previous drill testing. Nineteen holes were completed, three of which define a new high-grade shoot with intercept grades of up to 29.0 g/t Au over 1.2 metres true thickness. Step-out drilling is currently in progress testing the down-plunge extension of this shoot. 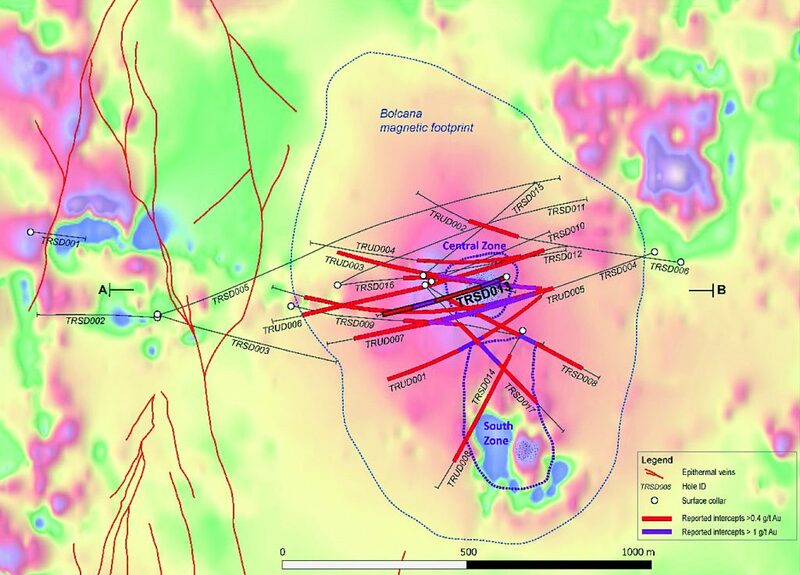 In addition, a 21.2 kilometre induced polarization survey was completed over the Efemcukuru license area in August 2017, with the objective of identifying blind drill targets in the footwall to the Kestane Beleni vein. Results are currently being evaluated, with drilling of new targets scheduled for 2018. Figure 3: Geological map of the Efemcukuru project area showing locations of 2017 drilling programs. Figure 4: Longitudinal section of the Kestane Beleni vein at Efemcukuru showing contoured gold grade times true thickness and piercing points for 2017 resource conversion drill holes. 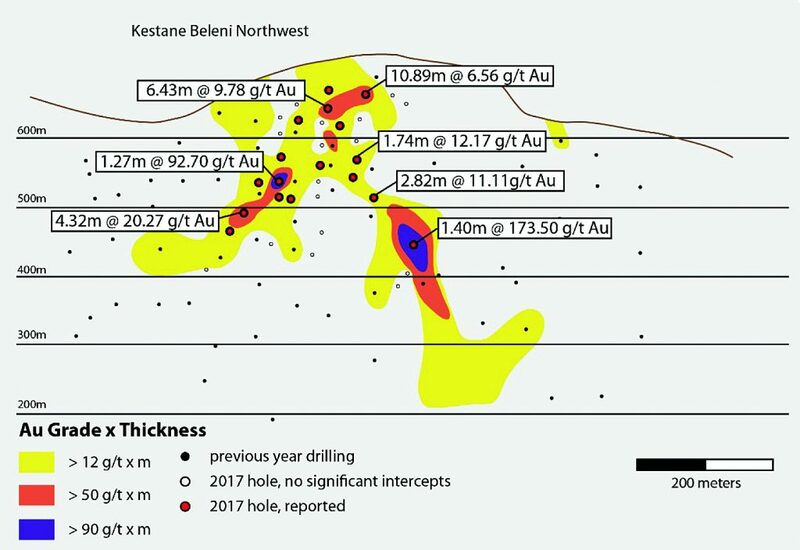 Figure 5: Longitudinal section of the Kestane Beleni Northwest vein at Efemcukuru showing contoured gold grade times thickness and piercing points for 2017 exploration drill holes. The Stratoni deposit is a high-grade carbonate replacement deposit consisting of massive sulphide lenses occurring within and adjacent to the Stratoni fault zone. The Company is currently developing an exploration drift in the hanging wall to the fault zone that provides platforms for drilling untested areas downdip of and along strike to the west of the known orebody. In the last year, 22 underground drill holes have been completed from the new development, which included seven resource conversion holes targeting existing inferred resources. Most of these holes intersected ore thicknesses equal to or greater than those predicted by the resource model, with high silver and base metal values. Resource expansion drilling to date has tested an area measuring approximately 100 metres by 100 metres downdip of the deposit. Nine of the 15 holes in this area intersected massive sulphide intervals comparable to those in the main orebody. Two drill rigs are currently active at the project testing additional step outs to the deposit. During 2017, at the Karavansalija Mineralized Center (KMC) project, approximately 18,500 metres of diamond drilling have been completed at the Shanac, Copper Canyon, Gradina, and Medenovac prospects. The Shanac prospect is a large magnetite skarn system d iscovered by Eldorado in 2016. Gold mineralization within the skarn assemblage is hosted by Cretaceous limestone underlying an altered and weakly mineralized Tertiary andesitic volcanic sequence. 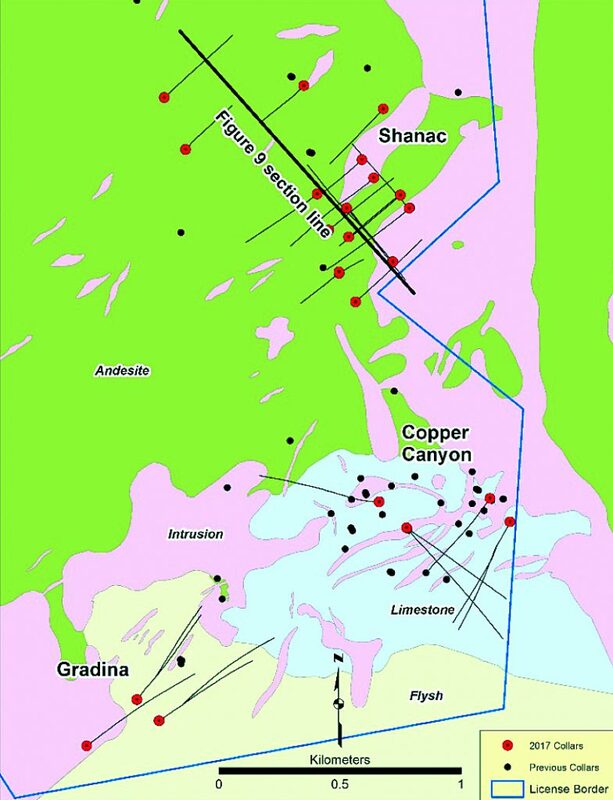 12 holes were drilled into the centre of the Shanac system in 2016 and an additional nine drill holes have been completed in 2017 to define the margins of the mineralized body. Gold grades within magnetite skarn at Shanac are typically 0.5 g/t Au to 2.0 g/t Au over vertical intervals of 50 to 200 metres beginning at depths of 150 to 300 metres from surface, with highest grades localized in a gently dipping lens just below the Tertiary volcanic rocks (Figures 6 and 7). Figure 6: Geological map of the KMC project area showing locations of mineralized zones targeted in 2017 exploration drilling programs. Figure 7: Representative cross section through the Shanac zone at KMC.